UNLIKE HAIR LOSS IN WOMEN, MALE PATTERN BALDNESS IS BOTH PATTERNED AND PREDICTABLE. Male pattern baldness is a phrase that is used a lot, but beyond understanding that our fathers’ or grandfather’s hairlines looked eerily similar to our own at a certain age, most of us have little understanding of the how’s and why’s of male pattern hair loss. It is safe to say that male pattern baldness (androgenetic alopecia) has been around as long as men have. When men lose their hair, they tend to lose it predictable ways, around the hairline and the crown of the head. 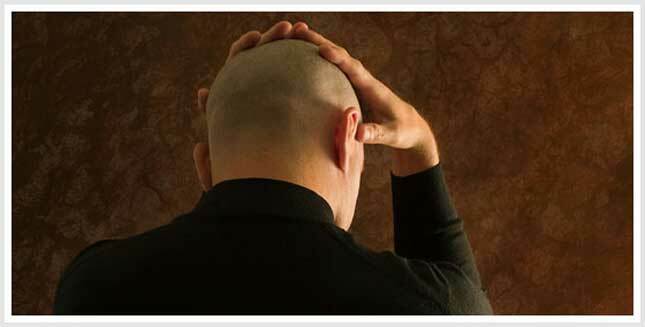 This pattern of hair loss is referred to as male pattern baldness. Genetics is heavily linked to male pattern baldness. Although Scientists still don’t know the precise genetic mechanism that triggers male pattern baldness, there is evidence to support the likelihood of genes as the instigators. Studies in 2006 and 2007 have shown that a variant on the X chromosome (the female contribution in a male’s XY combination) contributes to male pattern baldness. However other factors such as testosterone levels, and the fathers family history of hair loss, also contribute significantly to the condition. Other issues like stress, diet, lack of sleep, even smoking marijuana can have negative effects on your hair. A 2008 study done in Amsterdam, where marijuana is legal, concluded that its use “frighteningly” accelerated hair loss in men ages 18-45. To understand the process hair loss, it’s important to understand how hair grows. Like any other cell in our bodies, hair follicles go through cycles. Hair grows (sometimes for up to six years), then stop growing. It rests for a few months as a new hair begins to grow in its place, when the old hair is shed. Finally, the whole cycle begins again. At any given time, we are naturally shedding hair at a rate of 100 hairs per day. We don’t notice this unless we find an extraordinary amount circling the drain or on our pillows. When hair sheds, but fails to grow back, our hair thins. But male pattern baldness can take years to occur. This is because the DHT is slowly strangling your hair follicles at the root, depriving them of the oxygen and nutrients that healthy hair requires. Every time your hair grows back after a resting phase, it is thinner, less vigorous. And eventually, follicle-by-follicle, it stops growing back altogether. Ultimately, your changing hairline begins to fall into the Norwood Scale of male pattern baldness. On the Norwood scale there are different levels of hair loss, from lesser front hairline loss to severe baldness of the crown at the other end. Doctors and hair replacement specialists use the Norwood scale to evaluate and classify your hair loss. This can be a helpful tool in understanding the eventual progression of your male pattern baldness and to see where you fall in the scale range. Hair restoration is a big business industry with shampoos, topical treatments, and pharmaceuticals and over the counter products like Rogaine joining the ranks in the battle against hair loss with modest success. Studies show that products like minoxidil, and Finasteride (which inhibit the effects of DHT) are somewhat successful in stopping the shedding and show some improvement in 80% of men. The downside of these products is that once you stop using them, your hair will once again fall out. So it’s a lifelong commitment. On a more natural scale, chemicals like caffeine, Saw Palmetto and Chinese Knotweed have shown some promise in preventing hair loss. Laser technology is one of the newest concepts in preventing male pattern baldness. The theory is that low light laser therapy increases circulation and blood flow around the follicles, thereby nourishing them. 90% of patients who’ve tried laser hair therapy have seen improvement in the thickness and vitality of their hair. Unfortunately, laser hair therapy must be started early when follicles are still alive. Once gone, they’re gone for good and even laser therapy cannot revive them. Follicular hair transplants are, perhaps, the ultimate, albeit most expensive, solution to male pattern baldness. Hair is harvested surgically from the back of the head where it is not predisposed to genetic shedding and is grafted in 1-4 hair groupings in the bald areas of the scalp. These new techniques are safer and more natural-looking solutions to hair loss than hair plugs of yesterday and ultimately don’t require the constant maintenance and worry of nonsurgical hair systems. Whatever the reasons for hair loss, most men prefer to keep their hair. And without it, their self-esteem takes a real hit. If you are suffering from male pattern baldness and are looking for solutions, you will find the answers at a reputable hair replacement clinic. Whether you want to begin nonsurgically or jump into follicular hair transplants, you can find the best solutions for you.